People in the small Connecticut community of Newtown grieved on Saturday over one of the worst mass shootings in U.S. history and police sought answers about what drove a 20-year-old gunman to slaughter 20 children at an elementary school. 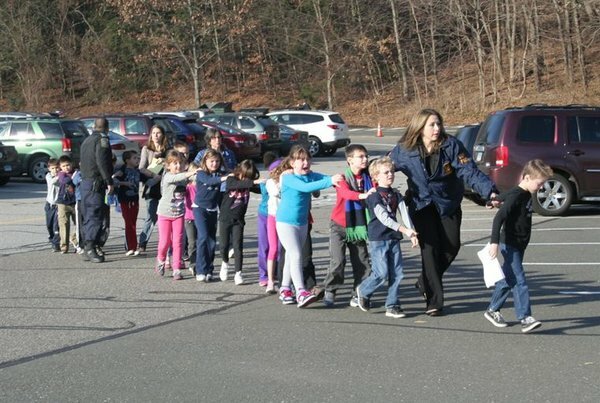 The attacker, identified by law enforcement sources as Adam Lanza, opened fire on Friday morning at Sandy Hook Elementary School, which teaches children aged 5 to 10. He is suspected of killing 26 people at the school before turning the gun on himself, as well as killing one other person at another nearby site. Police said the other adult was found dead at a related crime scene in the town. Many media outlets reported it may have been the shooter's mother, Nancy Lanza, who legally owned a Sig Sauer and a Glock, both handguns of models commonly used by police, and a military-style Bushmaster .223 M4 carbine. Law enforcement officials believe Adam Lanza used at least some of those weapons. Nancy Lanza was an avid gun collector who once showed him a "really nice, high-end rifle" that she had purchased, said Dan Holmes, owner of a landscaping business who recently decorated her yard with Christmas garlands and lights. "She said she would often go target shooting with her kids." Crime-scene investigators worked through the night, and state police said they hoped to have more information by Saturday morning, including confirmation of the victims' identities. President Barack Obama urged Americans on Saturday to join in solidarity as they mourned the victims, saying the hearts of parents across the country were "heavy with hurt." Obama, in his weekly radio and Internet address, called for "meaningful action to prevent more tragedies like this," but stopped short of specifically calling for tighter gun-control laws. The president wiped away tears in a television address on Friday, telling the nation, "Our hearts are broken." Newtown, an affluent town about 80 miles northeast of New York City, was mourning its dead in community vigils. "We're just praying - just need to pray to God that this does not happen again, no matter where," Amelia Adams, 76, said on her way into St. Rose of Lima Catholic Church with her husband Kenneth, 81. The church, a couple of miles from the site of the shooting, was packed inside and out on Friday night with a crowd estimated at more than 1,000 people, including a large crowd outside. "It was just, it was brutal. I can't think of a better word. It was just brutal to have to witness the pain today," Monsignor Robert Weiss said after the service. "We opened the windows (of the church) so people could just hear and feel they could be part of it," Weiss told MSNBC on Saturday, adding, "the worst days are ahead." "I'm sure this morning when they woke up and realized there was an empty bed in their house, it's becoming more and more real to them," Weiss said of the parents of the young victims. Connecticut Governor Dannel Malloy told reporters late on Friday he never expected to relive the kind of grief he and others felt after the September 11 attacks on New York and Washington in 2001. "Evil visited this community today," Malloy said. "(His mother) pushed him really hard to be smarter and work harder in school," said Tim Arnone, 20, who first met Lanza at Sandy Hook. New York City Mayor Michael Bloomberg, founder of the advocacy group Mayors Against Illegal Guns, said it was "almost impossible to believe a mass shooting in a kindergarten class could happen. "We need immediate action. We have heard all the rhetoric before. What we have not seen is leadership - not from the White House and not from Congress," Bloomberg said. "That must end today." World leaders expressed horror as they offered condolences to the United States. Washington's arch-foe Tehran also offered its sympathies, with Iran's Foreign Ministry spokesman describing the killings as "tragic. Pope Benedict conveyed his "heartfelt grief" through Vatican Secretary of State Cardinal Tarcisio Bertone. "In the aftermath of this senseless tragedy, he asks God our Father to console all those who mourn and to sustain the entire community with the spiritual strength which triumphs over violence by the power of forgiveness, hope and reconciling love," Bertone said. German Chancellor Angela Merkel said, "The news from Newtown saddens me deeply. Once again, we're completely aghast over an act that we can't comprehend. An incredible suffering has been brought to so many families so close to Christmas."